A simple example of code first approach in entity frame work. 1. Take the reference of entity frame work from Nugget Package and install it. 1. What is Entity Framework? Entity Framework is based on Object Relation model (ORM) framework developed by Microsoft. It will automate the Why of interaction between database and your code. 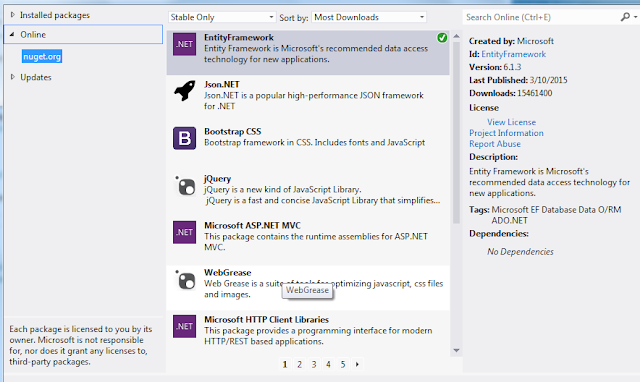 It makes your application as rapid develop by overriding for creating of framework for all your ADO.net. It make easier to access Data base using linq query. You can access the tables and storeprocedure detail in c# code and perform the crud operation very easily. Advantage of using entity framework is to generate the automated code to interact with data base. Its make your application in fast pace of development. Continuing the article what I left in previous article; will cover. Please see the part one before proceeding with this article. This articles is for whom who is going to start working on angularJs and want an over view of it and basic directive. Target audience is only AngularJs beginners. Once you reed you will get the answer of. 3. How data is binding in angularJS. 7. What is two way binding in angular. • AngularJS is a structural framework for dynamic web apps. I tried to find out but did not get proper solution for convert hexadecimal to decimal c# and finally after some research i find it out. So thats why posting that solution even it is one liner.